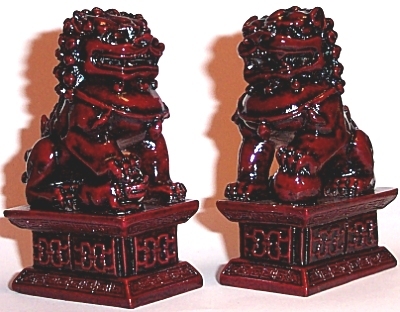 Also known as Fu Lions, Lions of Buddha, Chinese Guardian Lions Celestial Dogs, Happiness Dogs. Fu Dogs are symbols of wisdom, protection, power, happiness and wealth. Stone Fu Dogs are the sacred dogs of Asia that guard Buddhist temples, shops, hotels, banks, business premises, tombs, government buildings etc. They are believed to provide protection and scare demons and evil spirits. Fu Dogs are usually displayed in pairs. The male Fu Dog holds a ball (representing the Earth) which signifies wealth, business and protection. The female Fu Dog holds a cub, signifying protection of the members of the family or business premises. The male Fu Dog should be placed on the left, looking out of your home or business premises and the female Fu Dog should be placed on the right, looking out.